Why when the polar regions of Uranus receive a greater energy input from the Sun than its equatorial regions, Uranus is hotter at its equator than at its geo poles? Why is the magnetic field at the northern region (the upper half of the planet above the solar plane) stronger than the magnetic field at the southern region (the lower half of the planet below the solar plane)? Why does Uranus spin in a clockwise direction about its axis, when Earth, currently, spins in an anti clockwise direction about its axis? Why does the wind average speed reach 900 km/ hour (560 miles/ hour) on Uranus while on Earth an inconceivable top wind speed of Tornado stands at 510 to 600 km/ hour (319 to 379 mile/ hour)? an outer gaseous hydrogen/helium envelope where temperature drops below freezing point to an average of -205° Celsius (68° Kelvin). a magnetic dipole axis that does not pass through the centre of the planet. 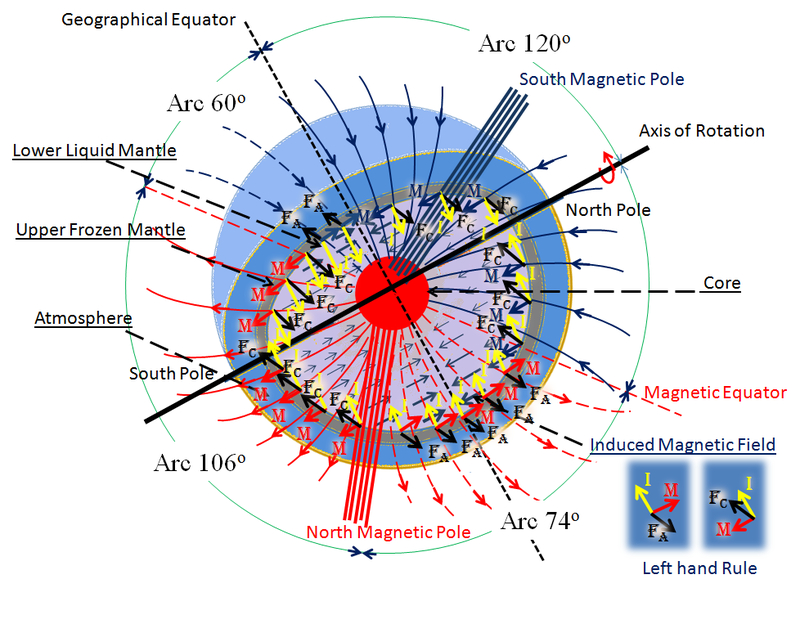 The south magnetic polarity pole in the northern region makes an angle of 44° with the axis of rotation while the north magnetic polarity pole in the southern region makes an angle of 76°. On Earth there is a similar situation, where the south magnetic polarity pole in the Arctic region makes an angle of 10° with the axis of rotation, while the north magnetic polarity pole in Antarctica makes an angle of 23°. To address the aforementioned questions, I attempt to apply on Uranus the same logic that I deployed earlier on Earth to find the true driver behind the magnetic field configuration and its influence on the formation of climate regions on the face of a planet, and the variation at the spinning speed of the planet about its axis; to be able to attend to the aforementioned first three questions for Uranus. On Space.com there is a full description Of Uranus atmosphere layer; the Troposphere where the temperature ranges from -153° to -218° Celsius , the Stratosphere where the temperature ranges from -218° to -153° Celsius, and the Thermosphere where the temperature is +577° Celsius. On Space.com there is such a quote “scientists are unsure as to the reason behind such a variation of temperatures, because the distance to Uranus from the Sun is so great and the amount of heat coming from the Sun is insufficient to generate such a surge in temperature”. As I explained earlier for the Earth temperature, the Temperature Belts, or regions of homogeneous climates are greatly influenced by the location of the magnetic pole, more than by the orthographic projection of the Sun radiation and/ or geo distance from the Sun. This is highly attributed to the radiation, which is generated from the collisions of charged particles that continuously arrive from the Sun with one another; as they spiral along the magnetic field force lines that engulf the planet. I explained earlier for Earth that due to planet spherical curvature, the magnetic field reaches maximum divergence at the mid distance between its two magnetic poles. The entrapped protons that arrive from the Sun move in helical paths along the magnetic field force lines. Where magnetic field force lines diverge at mid distance between the two magnetic poles, the helical width of the protons path is the longest, thus increasing the chances of protons collision with one another. The empirical model that I applied earlier for Earth temperature proved that the radiation, which is generated from collisions of charged particles in the Thermosphere layer varies in strength. It stands at a maximum, at the mid distance between the two magnetic poles, where charged particles spiral at their longest spiral width due to low magnetic intensity, where magnetic field force lines diverge due to planet spherical curvature. The radiation stands at its minimum above the two magnetic poles, where charged particles spiral at their shortest spiral width due to high magnetic intensity, where magnetic field force lines converge quite close, at which site protons spiral back to the other magnetic pole; except few protons that could penetrate to the Troposphere and collide with air molecules and generate the aurora borealis lights. I found out through mathematical modelling that on Earth, the energy generated by such collisions of charged particles with one another while spiraling between the two magnetic poles, is almost twice the energy that reaches Earth directly from the Sun. As with the case of Earth, Temperature Belts of homogenous climates are formed in circular bands whose centre is the nearest magnetic pole. On Earth, I explained how the relocation of the two magnetic poles leads to tilting of the Temperature Belts; resulting in Climate Exchange, where arid land became lush green and vice versa. Geological records carried evidence of it. Scientists called the region where the magnetic field force lines lie above the surface of Earth: Thermosphere, and I shall use the same term to name the atmosphere region, where Uranus magnetic field force lines lie above its surface. The charged particles collision’s thermal energy is at its maximum thrust in the Thermosphere region above the mid distance between the two magnetic poles (the magnetic equator), where the magnetic field stands at the lowest intensity, and at its minimum thrust at the Thermosphere region above the magnetic poles, where the magnetic field stands at its highest intensity. This makes the region of the magnetic equator to earn the highest temperature on the surface of the planet, and the region of the magnetic poles to be the lowest temperature on the surface of the planet and drags low the temperature at the neighboring geographic poles. Whether facing the Sun at close projection and proximity or not, the geographic poles will always have lower temperature than the planet’s magnetic equator, which happens to partially overlap with the geographical equator. This answers the aforementioned question 1. As explained earlier for Earth that by applying the Coriolis Force, it is evident that there are two types of magnetic field forces that are emitting from the core of Earth. A permanent magnetic field with clear south and north polarity poles, and an induced magnetic field force of south polarity at both geographies. This stands behind the Plasmoid phenomena that started to emerge and grew in Antarctica over the past 10,000 years. The source of induced magnetism is the spiraling electrons flowing at the Outer Core. On Earth, I found out that the source of the permanent magnetism is the Inner Core. The Uranus core is composed of similar material as Earth’s Inner Core, and that Uranus inner mantle, which is in liquid state performs a similar function to Earth Outer Core that is in liquid state as well. The fact that Uranus mantle has a high electrical conductivity, confirms that Uranus core is as radioactive as Earth’s Inner Core if not higher, otherwise where would the high flow of electrons come from. It also confirm that on Uranus inner mantle shell, there meet electric current, magnetic field and hence a produce Lorentz Force. The fact that Uranus has a greater mass, and does spin about its axis faster than Earth leads to one of three possibilities, following Earth spin speed model that I explained earlier on this site, in which I demonstrated that the Lorentz Force is the driver for any planet to spin about its axis. The 3 possibilities are (i) Uranus has a much powerful permanent magnetic field, (ii) and/ or, it has a much stronger electronic current that is generated from its core, (iii) and/ or, the angle between these two electromagnetic forces is an angle gap of 90°. Since Uranus average magnetic field at the surface is only 0.23 gauss (23 µT), which is weaker than Earth’s; having an average of 0.5 gauss (50 µT), and since the angle gap between the magnetic dipole and the axis of rotation is less than 90° as per the diagram above, then there is no escape but to have a much higher rate of electrons’ currents flowing out of Uranus core to fuel the Lorentz Force and bring the planet to spin about its axis at a faster speed than Earth even when its mass is 14.5 times that of Earth. The intensity of the induced magnetic field force lines is proportionate to the speed of the flowing electrons. The speed of the flowing electrons is proportionate to the distance from the centre of the planet following the formula of v= w.r ; where w is the constant spin speed and r is the distance of a flowing electron from the centre of the planet. A fast electronic current brings a strong induced magnetic field that reaches its peak at the tangent shell that separate Uranus lower liquid mantle from Uranus upper frozen mantle. Unlike Earth where the permanent magnetic field strength is stronger than the induced magnetic field. At the southern region of Uranus the strength of the magnetic field is 0.3 that of Earth’s, while at the northern region of Uranus, the strength of the magnetic field is 4 fold that of Earth. With simple math, you find that the strength of the permanent magnetic field is 2.1 fold that on Earth and the strength of the induced magnetic field is 1.8 that of Earth. The two types of magnetic interact with the electrons flow to produce Lorentz Forces at the shell separating the inner and outer mantle to cause the planet to spin. But, that is not all, as you could tell from following figure that Lorentz Forces are generated in opposite directions. The resultant of which causes the planet to spin about its axis in a single direction of course, but the tension caused at the layer that falls between the opposite force causes cracks in the frozen outer mantle and escape of hot inner mantle liquid to surface causing huge variations in surface temperature that lead to variations in pressure to bring winds of epic speeds. At the higher layer of Uranus mantle where the state becomes solid due to extreme low temperature at the surface, the interactions between (i) flowing electrons that always follow a perpendicular, spiraling trajectory to the axis of rotation, according to Coriolis Force for particles moving on a rotating disk or in rotating sphere, (ii) Permanent magnetic field force lines that flow out from a permanent north polarity magnet, and flux into a permanent south polarity magnet, and (iii) Induced magnetic field force lines of south polarity that are parallel to the axis of rotation (perpendicular to the electrons flow trajectory); all that lead to the generation of Lorentz Forces at the tangent shell between the two layers of the mantle. FC indicates Lorentz Force in clockwise direction and FA indicates Lorentz Force in anti-clockwise direction as per above figure. You find that the length summation of forces applied on areas under Arc106° and Arc120° is larger than that of Arc74° and Arc60°. Accordingly, the summation of the clockwise Lorentz Forces acting on the larger arcs areas is greater than the summation of anti-clockwise Lorentz Forces acting on the smaller arcs areas. The resultant torque out of these forces drives the planet to spin and explains why Uranus is propelled to spin in a clockwise and not anti-clockwise direction as on Earth. This answers the aforementioned question 3. 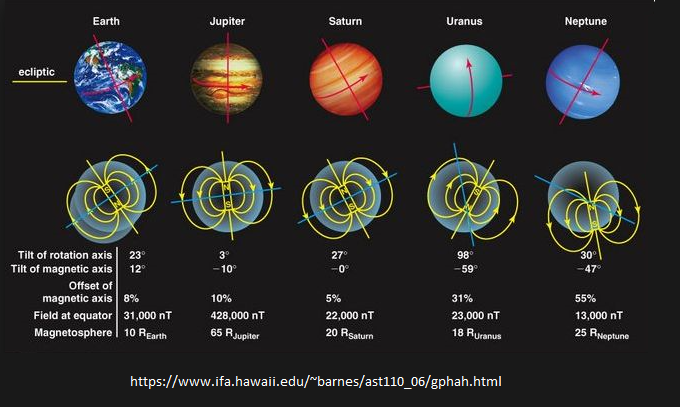 The Lorentz Forces that is generated at the regions falling below Arc60° and Arc74° are opposite forces to the neighboring Arc120° and Arc106° forces, and therefore cause a region of distress below the magnetic equator and cracks in Uranus upper frozen mantle. The collision of the opposite Lorentz Forces results in quakes and rifts in Uranus upper frozen mantle. The escape of liquid at high temperature from Uranus inner liquid mantle to surface through outer frozen mantle aperture leads to rising temperature on the surface. The variance in atmospheric temperature causes a variance in atmospheric pressure. As we know, wind is generally caused by differences in the atmospheric pressure, and when a difference in atmospheric pressure exists, air moves from the higher to the lower pressure region, resulting in winds of epic speed in the region south of the magnetic equator, and therefore answers the aforementioned question 4. On Uranus, the magnetic pole of north polarity is located in the southern region of the planet. The planet spin is clockwise. Planetary magnetic fields: Observations and models, G. Schubert ⇑, K.M. Soderlund, Department of Earth and Space Sciences, University of California, Los Angeles, CA 90095, USA.